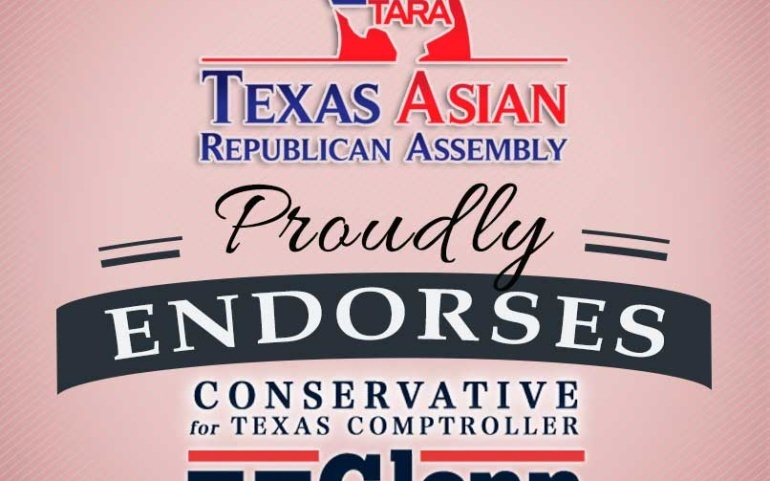 Austin, TX, September 16, 2014– The Texas Asian Republican Assembly announces its proud endorsement of Glenn Hegar for Comptroller. Glenn has served in both the Texas House and Senate, and is now the Republican nominee for Texas Comptroller. The Texas Asian Republican Assembly believes Glenn is the clear choice for Texans that value individual freedom, free market, and fiscal responsibility. Glenn Hegar served as State Representative from 2002 to 2006 and has served as State Senator since 2006. During the last Legislative Session, Glenn served as Chairman of the Subcommittee on Fiscal Matters that cut $1 billion in taxes for Texas taxpayers and businesses and as Chairman of the Sunset Advisory Commission that abolished six state agencies saving the state of Texas millions of dollars. Glenn is a sixth-generation Texan who farms on land that has been in his family since the mid-19th century. Glenn and his wife Dara live in Katy with their children, Claire, Julia, and Jonah. The Texas Asian Republican Assembly was established on June 8, 2013 as an official auxiliary to the Republican Party of Texas. TARA’s mission is to engage the growing Asian American community and build relationships based on the core values that we have in common: free enterprise, entrepreneurial spirit, less government, fiscal conservatism, strong national defense, strong family values, and a great education system. For more information about TARA, please visit www.TARAGOP.org. If you would like more information about this topic, please contact Christian Bionat at 832-228-5239 or email at communications@taragop.com.